Today I’m sharing Super Mini Chunky Monkey Ice Cream Sundaes, which deliciously solve an age-old problem for me. I’m hoping they’ll do the same for you all. Allow me to explain. Have you ever gone to a restaurant and wished you could have one or two bites only of an exquisite dessert? That first bite is pure bliss. The second bite is pretty blissful as well. But after that, with each additional bite, we tend to experience “diminishing returns” from our investment in the dessert. But what happens after we’re no longer experiencing that extreme pleasure? Well, in my case, I usually eat all of the dessert anyway. Wouldn’t it be wonderful to just have a two- to three-bite treat that answers our craving and then we’re done and satisfied? I’ve thought of this idea so many, many times, but even when baking at home, it’s hard to stop … even when my little voice is one of common sense. Sure, we can always make treats that are little bites, like mini muffins, but it’s pretty easy to go back for more. And don’t tell me to just freeze them because frozen baked goods usually taste far better than the original in my opinion! Luckily, through the help of a good friend, Lisa, I’ve discovered the solution to my “problem.” While Lisa is neither gluten free nor a blogger, she has a great Facebook page, The Crescent Wench, where she shares delicious recipes, many of which are naturally gluten free or adaptable. 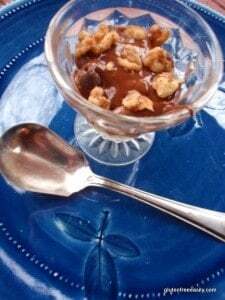 Lisa casually mentioned to me (in a Facebook conversation, our main means of communication) that she’d been topping frozen banana cubes with a sauce of chocolate and peanut butter, and a sprinkle of walnuts for a quick, satisfying, and decadent little treat. Oooh … I was intrigued! After getting the details, I immediately tried a slight adaptation of Lisa’s treat, creating these Super Mini Chunky Monkey “Ice Cream” Sundaes. They’re beautiful, perfectly sized, divine little treats that “hit the spot”! Make one for you and one for your significant other! These Super Mini Chunky Monkey "Ice Cream" Sundaes are tiny as far as sundaes go, but they have all the right flavors and are perfectly satisfying! When ready to make your sundaes, remove two banana cubes and place in your sundae dishes or bowls. Set aside for a few minutes as they need to thaw slightly. Add peanut butter (or almond butter or sun butter) and chocolate chips (or coconut oil-cacao powder/cocoa powder-coconut palm sugar mixture) to a small microwave-proof bowl or small sauce pan. Heat on High for maybe 15 seconds or so if using the microwave or heat on stove top until mixture starts to melt. Stir and heat an additional 15 seconds or son in the microwave or on stove top, if needed. All should be melted; stir well. Spoon the sauce over the banana cube in each dish. Adapted from Lisa Whitley of The Crescent Wench. If you are using liquefied coconut oil to make your chocolate topping, you will need very little heating time to create a smooth mixture. If using chocolate chips, you can sprinkle a few more on top of your melted chocolate topping if you wish. Remember that chocolate chips tend to hold their shape when microwaved, so don't assume they are not melted and overcook them. 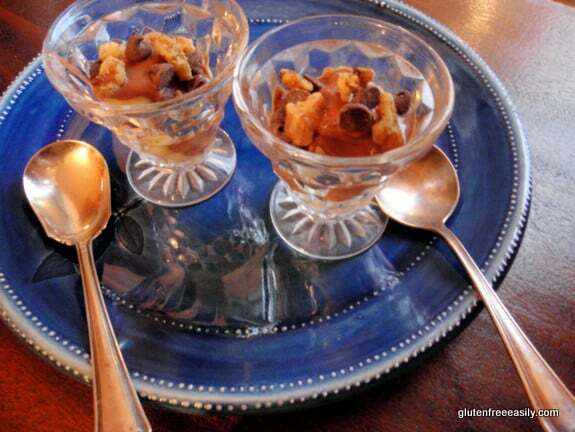 This recipe makes two Super Mini Chunky Monkey “Ice Cream” Sundaes. The dishes shown are very small. To give you an idea how small they are, I usually fill these dishes with toothpicks to serve with hors d’ouevres. That info and the fact that a banana “ice cream” cube is the base of this sundae gives you an idea of its ideal “super mini” size. As I like to keep things super simple, I also tried making these sundaes with frozen 2-inch banana sections and that worked to a point, but the frozen mashed banana cubes work much better as “ice cream” resulting in a far more delicious treat. Shirley – what a great idea. This sounds so yummy and a perfect way to get a few bites of deliciousness! A must try when craving something delectable. Nom nom nom! We also made ice cream made of frozen bananas and it was pretty awesome and simple to make! Now, the additions of the ingredients that you’ve mentioned in this post sound really good! This looks tasty Shirley! Yum! Perfect healthy deliciousness indeed, yummo! You are at it again with the delightful cooling summer recipes – good one!